New Jersey Gov. Chris Christie on Monday said that his office is cooperating with a subpoena from federal authorities investigating whether any laws were broken when lanes near a New Jersey bridge were apparently closed for political retribution. The Republican governor also said in a radio interview as he took questions for the first time in more than three weeks that he may have heard about the traffic tie-ups in Fort Lee when they were going on last September, but that it didn't register with him as a major issue if he did. 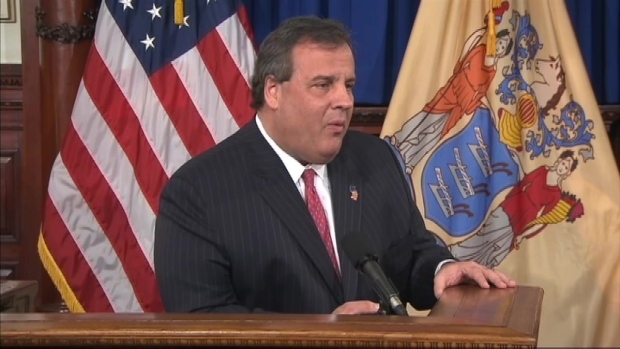 "Nobody has said I knew about this before it happened, and I think that's the most important question," Christie said in the appearance on his "Ask the Governor" radio show on Townsquare Media Monday night. A lawyer for former Port Authority official David Wildstein said in a letter Friday that the order to close the lanes was "the Christie administration's order" and said he had evidence tying the governor to it. He did not elaborate. Chris Glorioso reports. Meanwhile Monday, Christie's campaign sought to exceed New Jersey's election spending cap to pay for lawyers dealing with subpoenas stemming from a political payback scandal. A special legislative investigative committee said Monday it had begun receiving documents it requested in response to 20 subpoenas it issued last month. It's trying to unravel how high up Christie's chain of command a lane closing order went in September and whether the operation was meant to punish a Democratic adversary. Gov. Chris Christie began his State of the State address Tuesday by acknowledging that "mistakes were clearly made" when lanes were unexpectedly closed near the George Washington Bridge last year, apparently as a political payback scheme green-lighted by his aides. New Jersey Reporter Brian Thompson reports. Federal prosecutors have escalated their criminal investigation into allegations that Gov. Chris Christie's aides created traffic jams as political payback, subpoenaing his re-election campaign and the state Republican leadership. Brian Thompson reports. Ahead of Christie's "Ask the Governor" appearance, his administration released its plan for using a coming installment of federal relief money for Sandy — at least giving him something else to talk about. Mulvihill reported from Haddonfield, N.J. Associated Press reporter Ken Thomas contributed from Washington.